Sometimes it’s the unexpected games that set the standard. 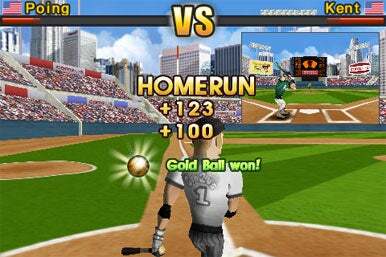 With almost no hype or licensing excitement, Com2us’ Baseball Slugger: Home Run Race 3D has proven this point for the iPhone and iPod touch. A combination between a home-run derby simulator and a role-playing game, Baseball Slugger has you create a baseball player and compete against others, all the while unlocking new items, equipment, and features via classic, arcade, training, and multiplayer game modes. Home Plate Showdown: The networking features in Baseball Slugger are what make this home-run derby game shine, as you face off against other players. Baseball Slugger’s graphics don’t push the envelope, but they serve their purpose nicely. A good blend of 2-D and 3-D as well as occasional flare effects draw you into the game while an amazing sound system delivers the roar of the crowd, the crack of the bat and the all the nuances of the ballpark experience. This, combined with well-timed vibrations of the handset when you get a powerful hit behind the ball, provide terrific immersive factors that keep you interested in the game. While most iPhone games go for the bells and whistles, Baseball Slugger 3D gets the important details right. A good auto-save system tracks records well, it’s easy enough to listen to your iPod music while playing, and the game behaves well under iPhone OS 3.0. These features aside, it’s the networking that makes the game shine—it’s a cinch to head into the online matchmaking mode, find an opponent, and compete in a quick home run derby to see who can reach a designated number of points first. While this works flawlessly over a Wi-Fi network, it’s a trickier ordeal over a 3G network connection, especially if the signal strength is known to fluctuate in your area. It’s the role-playing elements that make the game amazingly fun. While there is some grinding for experience points, it’s also rewarding to build an online friend list, play against other opponents and gain access to custom appearance configurations and equipment over time. This is carried off well by presenting both your game and your opponent’s game in a small corner window with live viewing of both players’ progress throughout the home run derby. When Apple released the iPhone OS 3.0 update last month, one of the highlights was much-improved networking tools for iPhone developers. Com2us seems to be demonstrating what’s possible via a terrific multiplayer interface as well as its plans to incorporate Bluetooth multiplayer gameplay. If you and a friend are in the same room, it should be cinch to face off against each other in an upcoming version of the game. With this $3 game, Com2us has created one of the best ways to spend 15 to 20 minutes on your iPhone, especially if you’re hankering to complete a level and upgrade your character. Even after a few weeks of availability, it’s clear that Baseball Slugger belongs on the App Store’s all-star team. Baseball Slugger: Home Run Race 3D runs on any iPhone or iPod touch running the iPhone 3.0 software update.